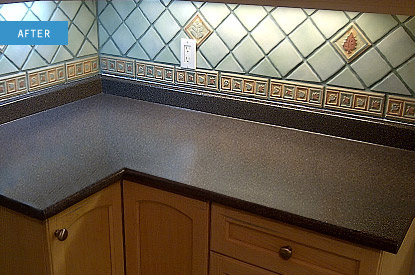 This was a very nice kitchen that featured decorative tile work but had a very tired old laminate countertop. 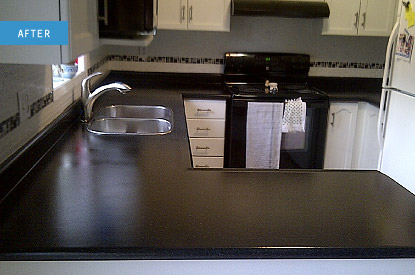 In a single afternoon, we resurfaced the countertop with a dazzling black solid surface and the homeowner was ecstatic. No tear out, no plumbing, no electrical…just beautiful! OK, we've all seen this before. 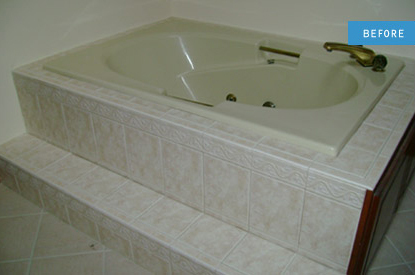 A tub that has not only lost its luster...but has the tell-tale track from the sliding glass door. That spells trouble for most applications - but not for us. 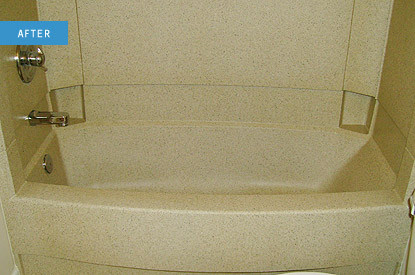 Take a look at this beautiful, artistic tub...and full shower surround. The bathroom is brand new again! 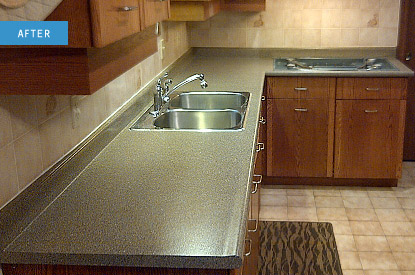 The only thing missing in this kitchen was a wow factor in the countertop – as the existing one was dull grey laminate. 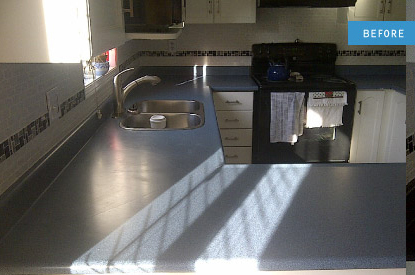 The homeowner selected a black marble finish and was literally knocked out by the result. We came in, did the job and they were using their new kitchen the next day. 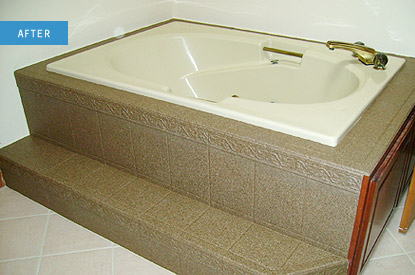 They call them Roman tubs because they have a tendency to look a little ancient. But when the eco system has a chance to shine, it turns the formerly outdated platform into a beautiful gem, worthy of the emperor. Here’s a big, big makeover. 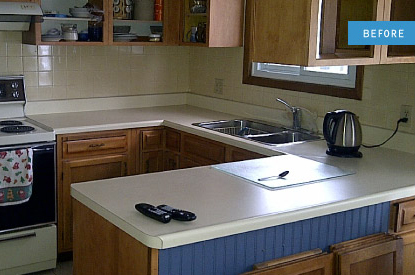 This homeowner wanted new countertops and refreshed cabinetry. 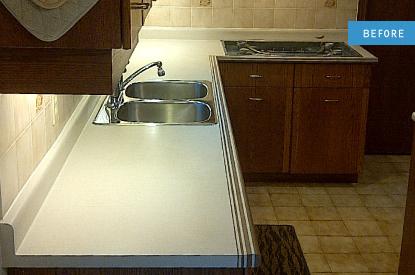 So, we not only resurfaced the countertop – changing it from a bland cream laminate to a solid surface but we also used our spray equipment to totally transform the cabinets. 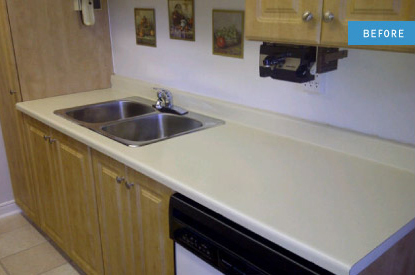 They are now dazzling white and the owner got this new kitchen for a fraction of the typical cost. 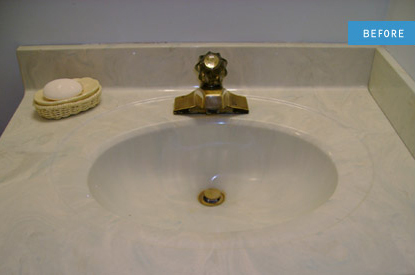 Bathroom sinks take a beating...mostly from the soap residue that dulls everything. 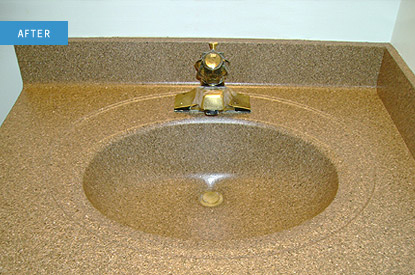 That's a simple change for the eco system and in just a couple hours, the sink is sparkling, with a long lasting solid surface look. A tale of two islands. 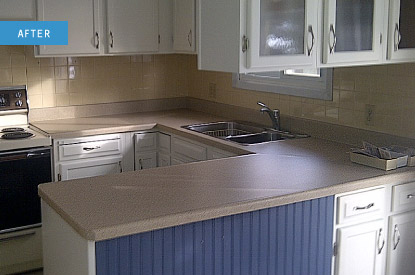 This was a very nice kitchen but the island workspace was wearing thin and was dated as well. 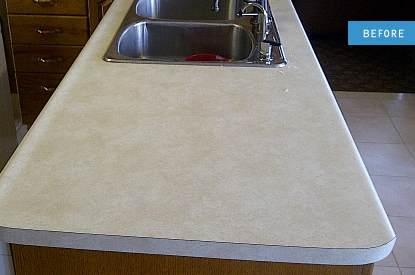 In a single morning session, we transformed it into a beautiful long lasting solid surface the homeowner raves about. 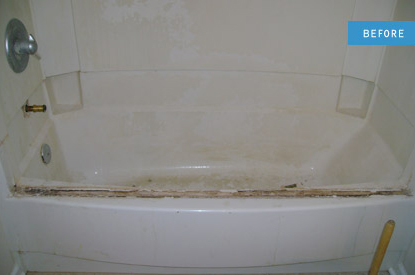 Shower stalls, especially those in hard water areas, are hard to clean and once they get to a certain condition...need to be dealt with. Don't haul it to a landfill! 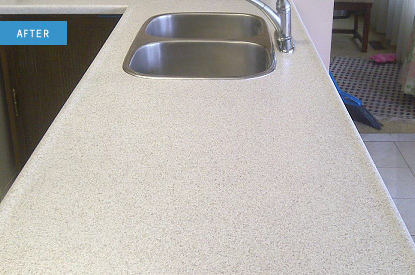 Give it a lovely, lasting new surface that makes the entire room sparkle. After a few years on the job, this faux marble laminate was not making much of an impression, so the homeowner was considering tearing it out. 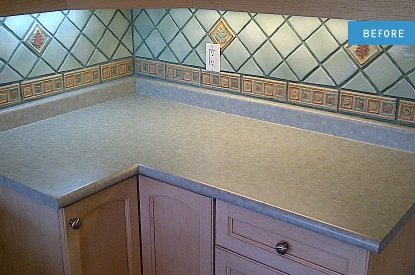 Not so fast, we said…what if we could totally change your kitchen in a few hours? 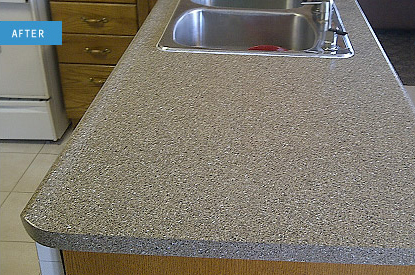 We did…and the resulting countertop makes the kitchen look brand new. 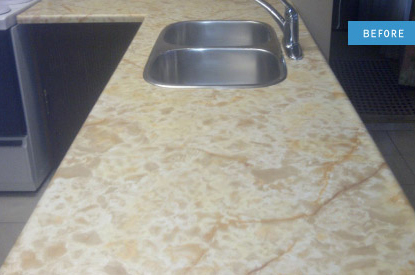 You might remember countertops like the one on the left. They were all the rage for a couple years in the 80’s and they really show their age now. Transforming this kitchen was a breeze. 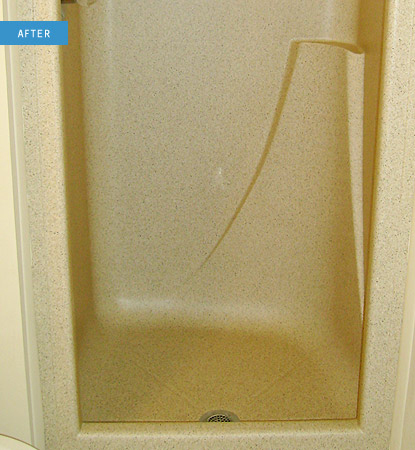 It took about 3 ½ hours to bring it into the present with a sparkling deep solid surface. 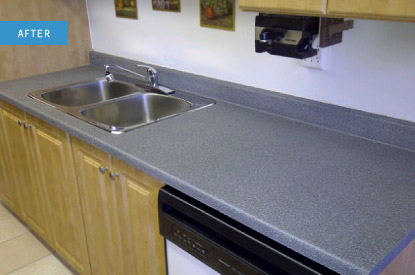 This is a small kitchen – but a nice job and a BIG change. 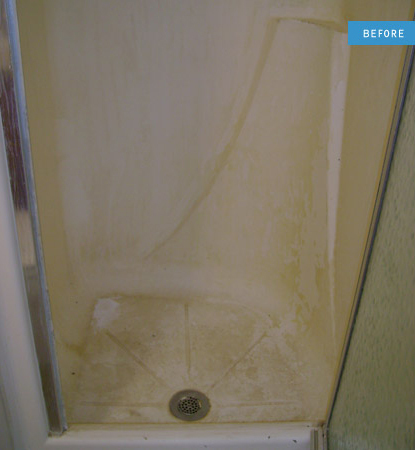 This is one of those that can be scheduled as the second job in a day…because the preparation is simple and straight-forward and the resulting finish saves the day for the homeowner.